Mayor Michael Bloomberg will be in Times Square today to celebrate the 40th annual Earth Day. Yesterday, he released a progress report for PlaNYC, the city's plan to improve the environment, economy, and enhance the quality of life to accommodate the estimated 1 million more residents by 2030. The statement says that the program has reached 57% of the planned milestones for 2009, completing Greenstreets projects and planting trees on the road to the stated goal of one million. The mayor's office has said it has improved transit access by rezoning 21 transit neighborhoods such as the 125th St. Corridor in Harlem, St. George in Staten Island, Coney Island and Greenpoint. But in an article published today by the Gotham Gazette, recent PlaNYC initiatives and developments have actually increased access and parking for cars, and provided less access to public transportation. Bloomberg's office said in a statement that "under the plan there has been a nine percent decrease in citywide greenhouse gas emissions, and over 322,000 trees have been planted as part of MillionTreesNYC." 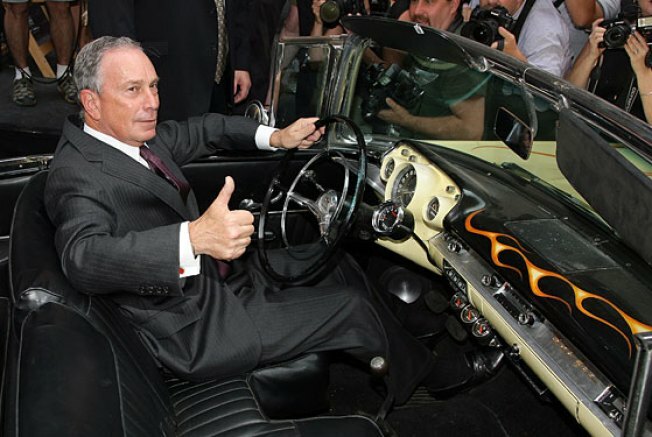 But Gotham Gazette writer Brian Paul, a master of urban planning student at Hunter College, points out Bloomberg's plan and recent support of increased automobile use will, over time, increase the city's carbon footprint. In Long Island City, Queens and Greenpoint, Brooklyn, a development boom lauded by PlaNYC has brought high-end luxury apartments to the East River waterfront--and close to 6,000 more parking space, he said. In addition to supporting new automobile use, Paul writes, "the city has done nothing to increase the capacity of the transit lines serving these neighborhoods, leading to serious overcrowding at stations like the Bedford Avenue L subway stop in Williamsburg. "The Metropolitan Transportation Authority's current budget will actually cut service to PlaNYC's "transit-oriented" growth zones. The G train, a crucial link in the transit system for Brooklyn and Queens," he adds, "will now terminate in Long Island City instead of running to Forest Hills, and numerous bus routes in the area are also facing major service cuts." PlaNYC's original plan was to use funds from Mayor Bloomberg's congestion pricing pet project to fund mass transit improvements. When that legislation failed, Bloomberg didn't have a back-up plan. Studies have also found that the city administration has done little to encourage New Yorkers in the outer boroughs to pick public transportation over car use. A study by the Furman Center last month found that 59 percent of city's downzoned lots are within a half a mile of a transit stop, which discourages mixed-use, car-free density in neighborhoods such as Bay Ridge and Dyker Heights, Brooklyn. 200 miles of new bike lanes, and pedestrian plazas in Times Square, Herald Square, and Madison Square. The city will be celebrating Earth Day in various locations around Manhattan today in collaboration with the non-profit organization Earth Day New York. The annual New York City EarthFair will be held inside Grand Central Terminal in Vanderbilt Hall from April 19-24, 2010 and outside of Grand Central Terminal on April 23 and 24.